Beyond their home port of Whitby, the lives of the Scoresbys, both father and son, rate very little mention. The father, Capt. William Scoresby, was born near Cropton in 1760 and died in 1829. During his life he was a renowned whaling captain and navigator in the Arctic Regions. He invented the crow's nest to protect seamen from severe weather conditions when on watch in the Arctic seas. His son the Rev. 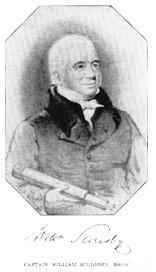 William Scoresby was also born near Cropton in 1789 and lived until 1857. Like his father he rose to be captain of a whaling ship and was for some 30 years a successful whaler. While in the Arctic regions he surveyed the coasts of Greenland and Jan Mayan island. He studied the flora and fauna and ice and snowflake formations under different weather conditions. Realising the importance of the magnetic compass for navigation he carried out some 300 experiments to determine how the effect of iron and physical force could affect the reliability of the compass. After 30 years at sea he joined the church. In addition to his work on magnetism he also carried out experiments on electro-magnetism and was in communication with many famous scientists of his day such as Faraday, Sir Joseph Banks, Joule and Ampere. Many of his original instruments are displayed in the Whitby Museum.